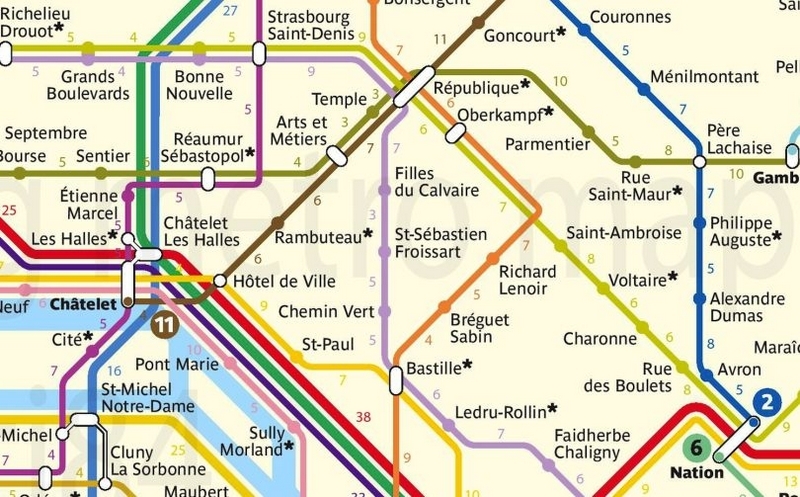 THE PARIS MÉTRO map changed countless times since the first line opened in 1900. The current version, highly stylized, has been around so long it seems like the new normal, but its days are limited — the métro authority is about to introduce a new edition. If you’re a tenderfoot trying to go from Point 1 to Point 2 and your route involves train changes, this will help. It’s one of those “Why didn’t I think of that?” brainstorms. Guillaume Martinelli, a consultant in transit planning, proposed adding a small number between the stations to show the walking time, in minutes. There are several smartphone apps for navigating the métro system, of which the best (IMHO) is the genuine one produced by RATP, the transit authority. But for those who remain attached to their paper maps, Martinelli’s revision looks like a winner.